Free music video DJ mixer. Choose from millions of songs for your party mix. ...... Use the crossfader to do the mix and rock your party. TubeDisco is a dual player and does seamless crossfading. While the previous song is faded out slowly the next song is faded in at the same time. 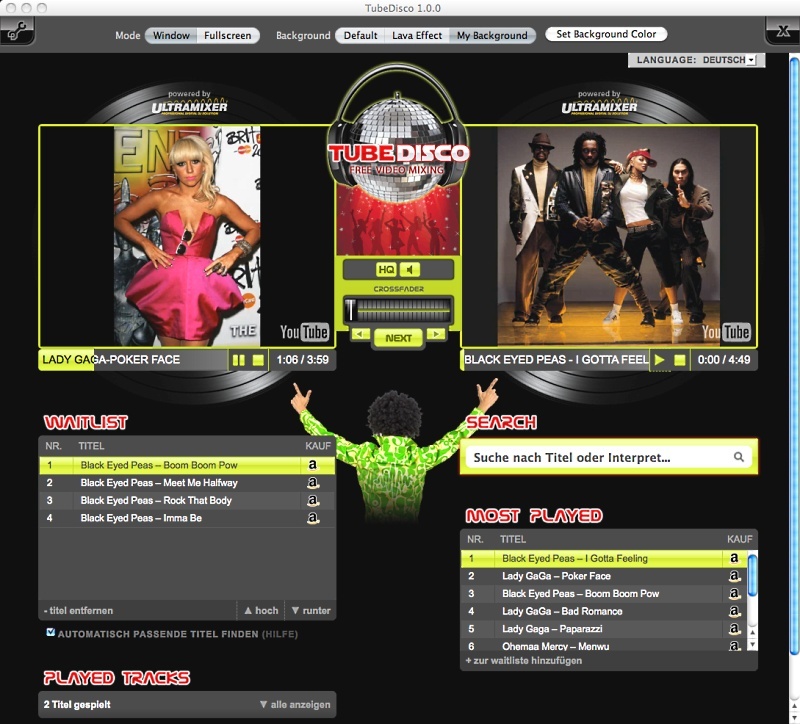 To do this TubeDisco uses two players similar to professional DJ or VJ software. While one YouTube video is playing the other is pre-loaded. If you want, you can play both music clips at the same time and use the crossfader to create your own funky mix. The auto-fill feature automatically finds matching songs and progressively creates a personal playlist for you. In fact, auto-fill allows you to use TubeDisco as your individual internet radio station. Search and add a first song to start with and TubeDisco will do the rest for you, if you want. Auto-fill automatically adds new songs to your waitlist based on what you heared before. It uses the songs from your waitlist and played tracks to find the next matching song. It excludes all recently played songs so nothing is played twice. Qweas is providing links to TubeDisco 1.0 as a courtesy, and makes no representations regarding TubeDisco or any other applications or any information related thereto. Any questions, complaints or claims regarding this application TubeDisco 1.0 must be directed to the appropriate software vendor. You may click the publisher link of TubeDisco on the top of this page to get more details about the vendor.